I am drinking a frosty magnum of Everest lager and tucking into a five-course Indian-style meal in the bar at Vajra guesthouse in Bhaktapur, Nepal, 'City of Devotees' near Kathmandu. There are 30 of us eating here–all guests and guides attending Yeti Cycles' first International Tribe Gathering. We've come to Nepal to ride mountain bikes six-and-a-half months after a 8.1 magnitude earthquake rattled this country from the roots, grinding centuries-old temples, stupas, homes and businesses to into piles of bricks and dust like a colossal mortar and pestle. The quake killed 9,000 people and injured another 23,000, and Bhaktapur was the worst-hit city near Nepal's capital, says Mandil Pradhan, lead guide for H&I Adventures, which is running the trip, as he points to a pile of rubble in the guesthouse courtyard. Bhaktapur is a UNESCO World Heritage site, and until a few months ago, there were more temples here than houses. A post-lunch walk around town is startling. Wooden beams scavenged from destroyed buildings support ornate temple walls still attached at the roof, though seemingly suspended in space. The front of the National Art Museum is similarly braced. At the same time, vendors are hawking their wares–some from bicycle seats, others squatting in the wooden doorways that line the city's choked cobblestone alleys. Plump cauliflower and spicy green chili peppers are piled on bright swaths of fabric along the sidewalks, where students walk home from school in starched and spotless uniforms. Men are playing cards on the street and dogs snooze in the shade of temple steps. Mandil works for H&I Adventures, the Scotland-based mountain-bike tour company that developed the tour for Yeti. It's been in development for four years, and Yeti and H&I launched the trip to coincide with Yeti's 30th anniversary. The trip sold out in 10 days. Then, on April 25, about six months before the trip was scheduled to start, the earth shook. Landslides buried entire mountain towns and buildings across the country wobbled, then teetered into piles of rubble. When the dust settled, Chris Conroy, Yeti's president, and H&I Adventures owner, Euan Wilson, had a tough decision to make: Run the trip or cancel. "We had Mandil on ground checking trails, accommodations, roads, fuel supply, health issues and more," said Wilson. "Every part of the tour was intact but one restaurant, from roads to trails to food and lodging. And everyone we work with in Nepal was saying, 'Please come–we need you.'" H&I Adventures owner Euan Wilson. So, here we are–30 riders on Yeti bikes, pedaling in and around Kathmandu on unexpectedly buff singletrack. And so far H&I's intelligence has proven to be spot on. The food is fresh and varied, the hotels are clean–even plush–and the riding is high-five worthy at every stop. Everyone we pass, whether they're 2-years-old or 90, whether they're stooped under massive wicker baskets piled with cabbages or meditating under a Bodhi tree, acknowledges us warmly. The first day of riding, we ricochet down a slippery cobbled walking trail just wider than my handlebars, and a cluster of sari-wrapped women cleaning rice at the side of the road flashes toothy smiles at our "namaste" greeting as we pedal past. The second day, a family sorting and stacking bricks, corrugated roofing and other debris–salvaging what they can to rebuild a corner of their house–waves hello, and a little girl welcomes us as we pass, nodding namaste with her hands pressed together like she is praying as each rider passes. I later hear two men on the trip say, "When I saw that, a bit of me melted inside." "With all the troubles that Nepal has had since April–to not put tourism dollars back into the economy would be a shame," said Wilson. "Tourism is the biggest revenue- generator for people here. 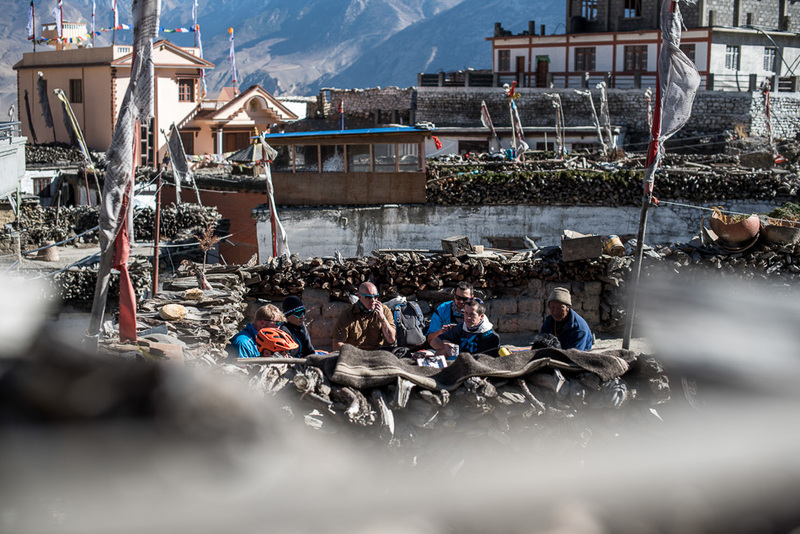 And bringing a group to stay at a tea house, eat at a local restaurant, and employing Nepali riders as guides all impacts people and businesses here in ways that aren't immediately obvious." "The person in the temporary tent you pass on your bike ride could also be person who is the waiter at your hotel," points out Mandil. "Life could be a whole lot worse for him if you weren't here." Mandil Pradhan, lead guide for H&I Adventures. I ask him if bringing riders, each one on a bike that costs what a Nepali earns in a year, is an oxymoron, hypocritical or worse? "Unequivocally no," he says. "Maybe you feel guilt as you pass through because you know the discrepancy in wealth between you and the people in villages, but for the Nepalese, we're a wonderful spectacle. And locals are extremely appreciative of the tourists who are still coming. That's particularly true of the trip. Fourteen staff are employed for at least two weeks each to support this trip, and all are earning about 10 times the average Nepali wage." A lot of tourists are scared to come to Nepal–tourism is down approximately 80 percent since the quake, according to Mandil, and it's Nepal's largest industry. That's not a surprise–it's hard to get accurate information about what the conditions are in country. Yes, there is damage, but in most of Kathmandu it's business as usual. "We have hot water, electricity and people here in the service industry who want to keep their jobs–I worry how long the service industry can survive without people passing through here," says Mandil. "Whether or not we should be in Nepal right now for the Tribe Gathering is a complete non-issue," agrees Conroy, a first-time visitor to Nepal. "It feels vibrant and positive and welcoming here. Whenever we get the chance to hang out with customers and ride it's an amazing experience. With 24 Tribe members here in Nepal, it's a special time. The riding we've done so far is fantastic, and like all Tribe Gatherings, it's all about the ride, sharing stories, hanging out, drinking beer. That's quintessential mountain-biking culture, and it transcends language, nationality and economics. We're doing all of that here in the land where the yeti came from–and there is absolutely nothing distracting from that experience–it's been a delight to be here so far, and we haven't even gotten to the mountains." The Yeti and H&I guests agree–I overhear other riders marveling at the brilliantly clean and deliciously cool hotel pool, the wood-fired pizza and the trails that dish up the best of the Himalayan foothills. And we're all moved by how warmly we've been welcomed at literally every turn. It's pretty clear that the locals appreciate tourists even more right now because we've come at a time when a lot of people are staying away. "I would have been gutted if H&I canceled the trip," said Jeremy Hanrahan, also a first-time visitor to Nepal, from Brisbane, Australia. "The best thing anyone can do to help Nepal is come to the country. We're only two days into a 12-day trip, and even if the trip were over now, I'd have had the most epic experience of my life." "Get on the plane," says Mark Nickolls, another Nepal first-timer, from Queenstown, New Zealand. "Doubt is exactly the reason Nepal is in trouble. The best thing you can do is come here and support the businesses that these people rely on to make a living–the tourist shops, the restaurants, the small lodges–that's the livelihood of country." We're here, we're buying beer and souvenirs and snacks, and paying for washing, shaves and rest-day paragliding. We're purchasing bike parts–one rider is renting an XT drivetrain. And most guests on the trip will donate chains, tubes, tires, brake pads and other spare parts, as well as medicine, clothing and money to local charities before they leave. When the quake hit, Mandil raised more than $5,000 from past H&I tour guests to help fund the rebuilding of 20 houses in a Kathmandu suburb. And the support will continue to flow to Nepal from H&I and Yeti. Together, they'll continue to bring mountain bikers to the spiritual home of the bike brand's mascot with another International Tribe gathering in Nepal in 2016. H&I's will also offer three to five of its own departures. "Mountain bikers everywhere in world share the same values," says Conroy. 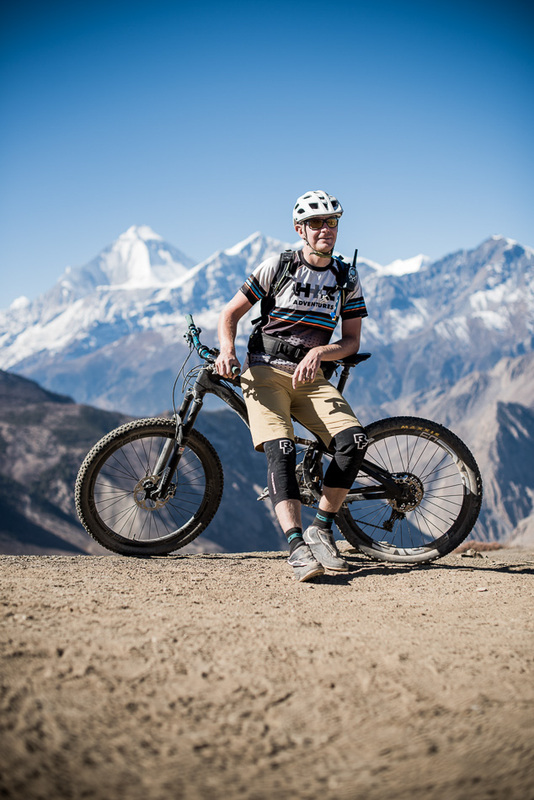 "Mountain biking brings people together–and that's what we're doing here in Nepal."